The fourth piece of the Armor of God is the “Shield of Faith”. Faith is an essential element of Christianity. The Bible tells us that it is impossible to please God if we do not have faith (Hebrews 11:6). The Bible also tells us that the righteous shall live by faith (Romans 1:17; Habakkuk 2:4; Galatians 3:11; Hebrews 10:38). Faith is such an important part of the armor that it protects all of the other pieces of the armor (1 John 5:4). Let us take a closer look at this thing called ‘faith’ to make sure we understand it. This faith protects us from anything Satan can throw at us. Whether he tries to tempt us, cause us to doubt, or become angry, the shield of faith stops his attacks cold. It is because, no matter what the circumstances look like, or feel like, we know we can trust God’s promises to be true. Therefore, when Satan sends a temptation our way we know that, “No temptation has overtaken [us] that is not common to man. God is faithful, and he will not let [us] be tempted beyond [our] ability, but with the temptation he will also provide the way of escape, that [we] may be able to endure it” (1 Corinthians 10:13 ESV). And it is the same with any other kind of attack Satan can muster. We know we can count on the promises of God. The Bible says that even the demons believe in God (James 2:19); but their belief is not one that saves. They believe in the fact that God will judge them one day and that judgment will not be enjoyable. The demon’s type belief is a belief in facts; it is not a trust and commitment to God as Lord. To be saved, we too must have a deep trust and commitment to Jesus Christ as Lord. A mere mental assent to the facts will not do. Faith is believing and trusting in God and His Word. We trust the picture of God’s character that we see in the Bible, we trust God’s provision for salvation through Jesus Christ, and we trust the truth of the indwelling presence of the Holy Spirit and the promise of victory over sin. Hebrews 11:1 tells us that faith is much more than wishful thinking, rather it is a confident, “…assurance of things hoped for, the conviction of things not seen” (ESV). This assurance is guaranteed by the presence of the Holy Spirit within us. There are some who teach that faith is a force in and of itself. The “Signs and Wonders” movement of the church was a major proponent of this type of thinking. They taught that faith is literally a force that the believer can control for his own purposes, much like the Star Wars force. They taught that this faith [force] was given to them when they were saved and they could use it any way they chose. However, this is not the biblical idea of faith at all. A story from the Gospels illustrates this point far better than I can. We read in Mark 9:14-29 (also found in Matthew 17:14-21) about a father in whose son dwelt an evil spirit that tortured the boy continually (Mark 9:17-18, 21). The father loved his son and desperately wanted him healed. The father told Jesus, “So I asked your disciples to cast it out, and they were not able” (Mark 9:18 ESV). The disciples were unable to heal the boy. Jesus healed the boy and His disciples asked Him later, “Why could we not cast it out?” (Mark 9:28 ESV). Jesus had previously given His disciples authority over unclean spirits, “…to cast them out, and to heal every disease and every affliction” (Matthew 10:1 ESV; cf. Mark 6:7). Should they not have been able to cast out this tortuous spirit? What prevented them from doing such? Jesus answered His disciple’s question this way, “This kind cannot be driven out by anything but prayer”* (Mark 9:29 ESV). Jesus was telling the disciples that they had not prayed enough to be able to cast out the evil spirit that was in the boy. Prayer is not a force, it is not a magical incantation; it is coming to God seeking His will, His guidance, and His power. I believe this is an example of the disciples thinking they could do the things Jesus did without relying on Jesus. They believed they had the power themselves. Jesus showed them that any strength that the believer possesses comes from his or her relationship to God [Jesus]. If there is no proper relationship, there will be no power. James tells us, “But be doers of the word, and not hearers only, deceiving yourselves” (James 1:22 ESV). The Lord Jesus even issued this warning, “Not everyone who says to me, ‘Lord, Lord,’ will enter the kingdom of heaven, but the one who does the will of my Father who is in heaven” (Matthew 7:21 ESV). Christianity is not a static religion. We are not to simply sit by and silently enjoy our salvation. The believer is to live out his or her faith; actively following God’s will for their lives. We are to be Jesus’ hands, feet, mouth; we are to be the body of Christ here on earth (1 Corinthians 12:27). Bodies that do not move around grow unhealthy and unproductive. God saved us for a purpose; we owe it to Him to serve that purpose. Jesus instructed His disciples (that’s what we are) in this way, “Go therefore and make disciples of all nations, baptizing them in the name of the Father and of the Son and of the Holy Spirit, teaching them to observe all that I have commanded you. And behold, I am with you always, to the end of the age” (Matthew 28:19-20 ESV; cf. Mark 16:15-16). We are to share the good news of salvation, through faith in Jesus, with every one we can. If we do not take the Gospel to people, “…how are they to believe in him of whom they have never heard? And how are they to hear without someone preaching?” (Romans 10:14 ESV). It is up to you and me to share God’s good news of salvation and forgiveness with a lost and hurting world. This is faith in action. There is so much more that could be said about the topic of biblical faith that I had to leave much unsaid. One point that needs to be made is that this piece of the armor is specifically noted as being able to deflect Satan’s attacks. However, we must remember that our ability to resist Satan comes from our relationship with God, “Submit yourselves therefore to God. Resist the devil, and he will flee from you” (James 4:7 ESV). We are powerless to carry out the second part of this verse unless we obey the first part. It is very important that we nurture our faith at all times, by reading and studying the Bible, by praying constantly (which is addressed in the passage directly following the ‘armor of God’ passage), and by seeking to love God and live for Him more everyday. In this way we can be sure our Shield of Faith is impenetrable. *Some manuscripts add, “…and fasting” to this phrase. However, for our study, it does not alter the meaning. Wonderful as always brother, particularly that our faith should be shared. Sharing the gift of eternal life is about the greatest thing we can do besides glorifying Jesus Christ. I need this shield daily, as you do also, for we are both experiencing the need for it more and more these days in a world growing colder day by day. Thank you and I thank God for you Robert. I sincerely thank you and give God the glory. I am honored to be in His service. God bless you. 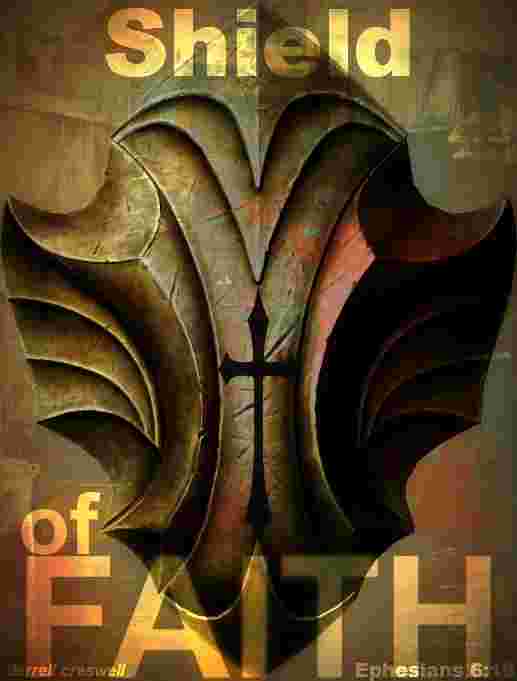 I was reading the elements of the armor but when I click on the sword of the spirit article I get the details for the shield of faith? Hmmm…try it now. When I click on the Sword article, it goes straight to it. Respond back here when you check it please. If it doesn’t work, I’ll see if I can get someone to fix it. God bless you. Yes, same here; I click on the sword and get the shield. I would really like to have the sword article to complete the full armor. How can I obtain it? It has been coming up fine for me. Let me know if this link takes you somewhere else?